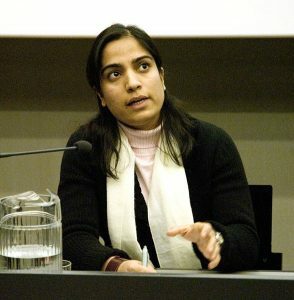 Photo:Malalai Joya, an activist, writer and former politician from Afghanistan. Photo by AfghanKabul accessed on Wikimedia Commons. Afghanistan is a landlocked country located in the center of Asia, forming part of Central Asia, South Asia, and Greater Middle East, it is also considered to be part of a broader West Asia. Afghanistan is a diverse, multiethnic society. The Pasthun make up its largest ethnic group, followed by the Tajik, Hazara, Uzbek and other minority ethnic groups. The Afghan population data represent DNA samples from 130 random Afghanistan individuals who were sampled in 2005 by Sezione di Biologia, Rome, Italy. Source publication: Autosomal STR Frequencies in Afghanistan Population, JFS, 2005, p1494-1496.